For the past few days I have been working with SOAP on a number of platforms. I wanted to use NuSoap with PHP5 and here are a few steps which will allow you to do so. As PHP5 has an inbuilt support for webservices it will clash with the names in nusoap.php. To get over this rename the class soapclient to soap_client. Also rename the constructor soapclient to soap_client. This is all that needs to be done. Once you do this you would be able to run NuSoap with PHP5. I know I might have trashed GooglePages on the first look. But as I have started using it, there is something about it that makes me say its awesome. Finally it is the best way to move your things from one place to the other. I really don't like the webhosting part but I really like the fact that I can use it like a web drive. 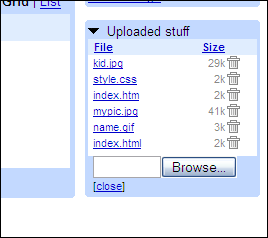 So if you want to upload a file all it takes is a single click and you are done. No messy emails to take care of. It is hard to describe why its better but only once you start using it will you know how easy it is to manage your files. That was the good part :), but there is also a problem, you cannot make directories. So if you have many files it will become difficult to manage things once the number of files increase. I know many people hate the blogger bar, but removing it is most probably against the policy of blogger. You can only remove it if you are using a FTP based account and hosting it on your own servers. I have seen may people completely hiding the navbar but that is against the policy. While designing this new template I had tried to merge the navbar with the rest of the doucment but I failed miserably. So I came up with this. It will not remove the bar completely. It will only be visible on a mouseover event. It works in Firefox, Opera 9 and Safari. On IE it will show a translucent navbar, which looks better than the original bar. Add this code in the head tag of your blogger template. Incase you want to use this template on your own blog contact me.